Children's hospitals, their departments pediatrics, psychiatry and psychology, use the DollsVilla by Liliane® for the observation of the child and the parent-child interaction. And for the processing of hospitalization and any traumatic experiences which are related to the hospital. In the field of child psychotherapy, the DollsVilla by Liliane® is used for therapeutic play to facilitate contact with children, to support diagnoses, and even as a form of treatment. A Dutch health care psychologist: "The Doll’s Villa is suitable for perception and treatment”. While they play, children reveal ‘hidden information’ about themselves. Together with their own doll to the doctor and play with the DollsVilla by Liliane®. Doctors use the Villa to make contact with children and to prepare them playfully on a possible surgery. shares her inspiration for taking her passion to protect the planet into her business. "We must learn to be protectors of nature and appreciate everything that it provides us. It is important for young children to be around natural materials, to be able to touch, feel, smell and interact with their unblemished nature." "I am passionate about introducing children to the wonders of wood through play as this interaction contributes to an awareness of sustainability at a young age. Children are capable of developing a real connection with the products of this earth and we need to encourage that as much as possible for our Planet to thrive." 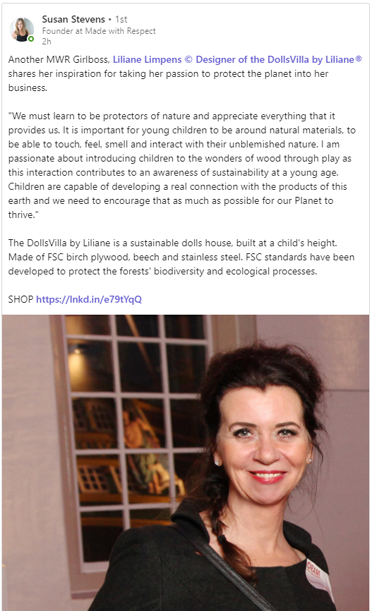 The DollsVilla by Liliane is a sustainable dolls house, built at a child's height. Made of FSC birch plywood, beech and stainless steel. FSC standards have been developed to protect the forests' biodiversity and ecological processes. Made With Respect has been created with a purpose: All the brands fall within our 4 pillars and align with one or more of the following values. MWR is a positive movement, where buying conscious brands is the norm. For a sustainable future for our people on our planet. "We are very enthusiastic and would love to give this beautiful DollsVilla a place in our Pediatric department." - Priscilla Wiegers | head of the children's department of the Albert Schweitzer Hospital. The Albert Schweitzer Hospital is a top clinical hospital, with locations in Dordrecht, Zwijndrecht and Sliedrecht. There is a outpatient clinic in Ridderkerk. The name of the hospital is a tribute to doctor and missionary Albert Schweitzer, who devoted his life to patient care in West Africa. "This week I had a teenage girl of 13 who was playing intensely with the DollsVilla, her mother said she had never played with dolls." Play therapist and owner Simone Anghel-Kos of the new practice for play therapy ZIJN in Heerhugowaard gives the DollsVilla by Liliane® a leading position in her work with children. "I am very happy with the DollsVilla and the reactions are also very nice. The villa immediately invites imagination and the space in the villa and the material are so nice!" "Children can not yet process their emotions as adults do. Adults have learned that talking can help. For many children it is still difficult to talk about their feelings, fears and worries, and they often do not have the words for it either. Playing is the language of children, and without being able to talk about it, a child can show what he or she is doing in play." "We are still very happy with the beautiful DollsVilla by Liliane® and it is played very regularly. 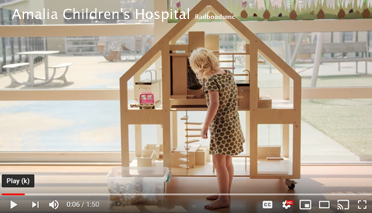 Recently we made a short film about the Radboudumc Amalia children's hospital. Opening by the DollsVilla by Liliane®" - Claudia Schreven. Every year approximately 22,000 children between 0 and 18 years of age are treated in the Amalia Children’s Hospital of the Radboud University Medical Centre in Nijmegen. The Hague WTC January 28, 2019 - Task Force Health Care and Liliane in action during the Starters International Business session w/ coach Thijs Teeling & TFHC Mieke Flierhuis. 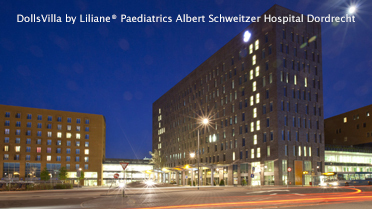 To create an entrance for the DollsVilla by Liliane® in the departments of Pediatrics within the hospitals in the US and Germany. 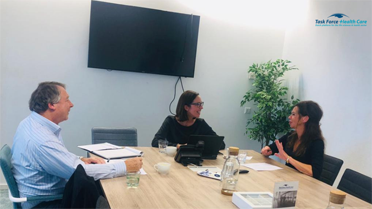 A cooperation between the Netherlands Enterprise Agency, Task Force Health Care and a team of experienced healthcare experts, for an individual coaching programme whereby experienced ‘healthcare export experts’ support and help with specific export quests, approach and strategy. 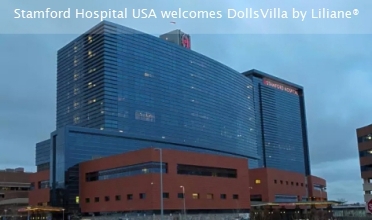 The very first hospital in the United States welcomes the DollsVilla by Liliane®. And there is another scoop. The Stamford Hospital, not far from New York, is the first facility in southwest Connecticut with a pediatric emergency department. In this pediatric department a separate child-friendly waiting room is created. The DollsVilla fits perfectly here as it helps comforting children as they can escape into their own little world for a moment. A result of the work of Melanie Dowling - Business Developer DollsVilla by Liliane® USA. Stamford Hospital, residing on the Bennett Medical Center campus, is a not-for-profit community teaching hospital. Stamford Health System is Planetree designated and is a major teaching affiliate of the Columbia University College of Physicians and Surgeons.